Indeed Conway did finish her degree. She went on to teach and write, and to move to the United States for graduate work at Harvard. At the age of forty she was appointed the first woman president of Smith College. As much as she loved it the academic life was a long way from Conway’s girlhood on her family’s sheep station in New South Wales. The farm, called Coorain after an Aboriginal word meaning ‘windy place,’ was an isolated but beautiful tract of open land. Life there was marginal and threatening. Growing up the only girl in a family of five, Conway didn’t see another girl her age until she was 11. She remembers her mother treated her own ruptured eardrum with warm salt. A catastrophic eight year drought forced the family to leave Coorain. 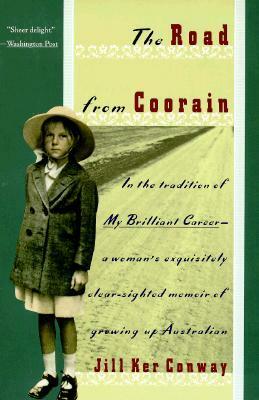 Her 1989 memoir, The Road from Coorain, describes Conway’s transformation from rural girl to intellectual woman. It’s what Conway has called a “quest narrative,” and a deliberate attempt to write a woman’s story outside of a romantic narrative. Indeed, Conway’s story concerns reconciling the Australia she loves with the Australia she experiences, the Australia she knows with the Australia she has felt. It’s also the story of an expatriate in the making. Despite her marginal status, Conway clearly loves Australia and its people. (She says that one of her motivations for writing the book was to combat the myth of the Crocodile Dundee Australian male, a ‘vulgar projection of the Australian male myth.’) When she chooses the academic career path, her attachment to the plains of New South Wales forms her resolve to write an Australian history that stays true to that arid land. Published in 1989, The Road from Coorain sparked a trilogy. (It was also adapted for television in 2001.) The other titles in Conway’s autobiography series are True North and A Woman’s Education. Escape is the ultimate fantasy. Most of us never realize it. For a privileged few, escape can be a luxury, usually defined in relative terms. Even if we can afford to get away from it all, reality, be it cultural or financial, has a way of dragging us back to the grind. This sad truth drives Rebecca Walker’s wise novel, Adé. The novel’s narrator, Farida, recalls a travel journey with her college friend, Miriam. The trip becomes a cultural and personal reconciliation for Farida, whose identity is in flux. The deeper Farida gets into Africa – first Cairo, then the Sinai, then sub-Saharan Africa – the more comfortable she starts to feel. On a small island off the Kenyan coast, Farida meets a fisherman named Adé. He’s polite, attractive, and feels like destiny. And so, Farida decides to stay put. Adé and Farida fall happily in love. When they plan to marry, difficulties arise. Adé’s traditions don’t jibe with the political reality of contemporary Kenya. Farida’s family is thousands of miles and cultural light years away. Walker’s novel is spare and luminous. It’s a laconic condensation of modern day academe – issues of post-colonial theory, Orientalism, and critical race theory are all present and accounted for. But Adé is light and airy where academic theory would drag. (It’s no accident the novel begins with its characters at Yale.) Reading it is a vicarious disappearing. Adé tumbles from the familiar – a crisp New England fall day – into the exotic – the mangrove swamps around a remote fishing island – effortlessly. The story’s landmarks are cultural – the food, shelter, and conversations people around the world enjoy. It offers the hope that we can, should we choose, shed our cultural identities. If only it could be so easy. 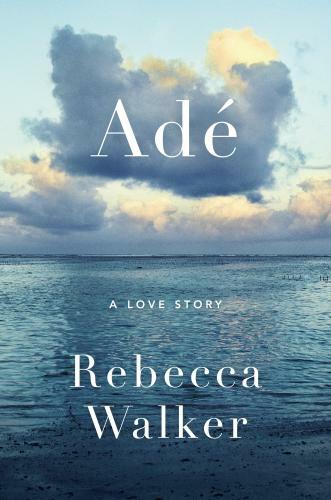 Adé is Rebecca Walker’s first novel. She is best known for her memoirs Black, White and Jewish and Baby Love. When they didn’t ride along the river, Nathan favored an east side outskirt of abandoned or almost abandoned warehouses and factories, the streets there usually empty, and always of cops. The structures formed a three-story sheet metal ravine, their echo spectacular, the motorcycle a contained and rainless thunderstorm ricocheting between walls. The deserted hulks seeped not just eeriness, but somehow anger, even surprise, but Janie and Nathan were shielded from that by the speed of the bike. Them rocketing past enigmatic geometries, cylinders and chutes, cupolas and cones, past towering red letters threatening head injury and limb loss, past windows, if not shattered, so spider-infested Janie could make out webs at fifty miles per hour. These were places that used to make things, not chemicals, electricity, gasoline, but things you could actually touch, and now the vegetation rising, the weeks shrouding, pressing fecund, wanton, “plants” and “plants” Janie’d think in her alcohol haze, noticing for the first time how the word had been stolen, but ultimately the first plants had won. 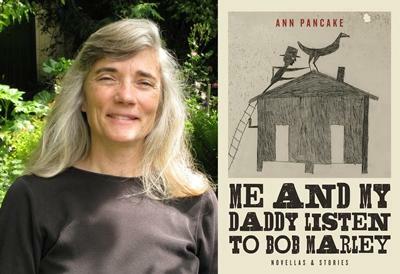 Many of these stories are set in Pancake’s native West Virginia. Readers who know Southern Appalachia will recognize the scenery – simultaneously lush, poor, grand, and confined – and the politics. Pancake’s first novel, Strange as This Weather Has Been, dealt with the crisis of mountaintop removal mining. In Me and My Daddy Listen to Bob Marley the story Arsonists revisits this subject most explicitly. In it we see that those trapped by the economics of the coal industry stick together as best they can. Although the book vibrates with Southern Appalachian air, these stories speak beyond the region. Demographic change is turning small town and rural America into a memory. Or a fiction. Today little of the real world of rural America shows up in mainstream media. Reality television shows mythologize the rugged and macho “dirty” jobs of those living outside American cities. And we have a paucity of writers treating rural American communities seriously. Pancake shows us the beauty, tragedy, and poetry in these endangered lives. Natalie Axton is the editorial director of Critical Read, a new platform for original writing on the fine and performing arts. When you were a little girl and you imagined your grown up life, did you picture yourself as a mother? For most women the idea of having children is a matter of course, one of the developmental stages of life. But there are many women who have no maternal urge. Choosing to remain child-free of course makes them no less feminine and no less caring. Still, their stories are fewer and carry a whiff of taboo. For writer Molly Peacock the decision not to have children arrived when she was five years old. 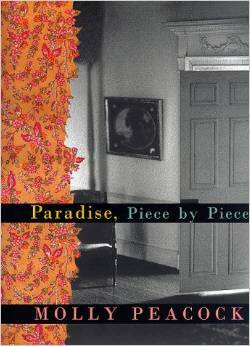 Paradise, Piece by Piece, Peacock’s 1998 memoir, tells the story of her decision to remain childless. To the young Peacock, children seemed to have ruined her family member’s lives. Peacock’s father, an alcoholic, terrorized the family with now-you-see-it-now-you-don’t love and affection. Eventually Peacock’s mother retreated into workaholism, leaving the young Molly Peacock to provide all domestic duties for the family. Remaining childless is a decision the writer makes many times over the course of her life. Breaking free of her dysfunctional upbringing and finding her way – to college, romantic relationships, work, and art – arcs the story, but Paradise, Piece by Piece is not a confessional tale of victimhood. It’s a survival story, for sure, but Peacock has reserves of self-awareness and artistry to draw on. When she loses herself in a romantic relationship with a choreographer the author recognizes what she has done immediately. When she becomes a teacher she makes clear it is not children she is rejecting by refusing motherhood. Molly Peacock is a prose writer and a poet. She has served as the President of the Poetry Society of America and was instrumental in creating the Poetry in Motion series that adorns New York City subways and buses. Her most recent chapbook, A Turn Around the Mansion Grounds: Poems in Conversation and a Conversation, is a collaborative project and was published by Slapering Hol Press in 2014. 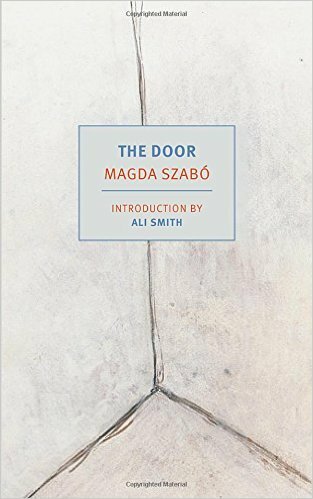 Her most recent prose work is Alphabetique, 26 Characteristic Fictions. Choosing not to have children is a position Peacock herself describes as ‘radical.’ (Imagine if all the women of the world decided to forego reproduction.) It’s a decision Peacock admits defined her. (Interestingly, Peacock’s closest female friends, whom she met in college in the 1960s, all remain child-free as well.) At a time when having-it-all perfectionism has edged out choice in women’s lives it’s important to remember that many women want to live without becoming mothers. Similarly, the choice between being a caregiver and having an independent life is a false one. Learn about Molly Peacock here.